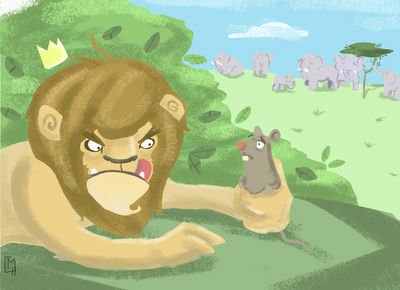 The lion was hungry and was about to eat a mouse. 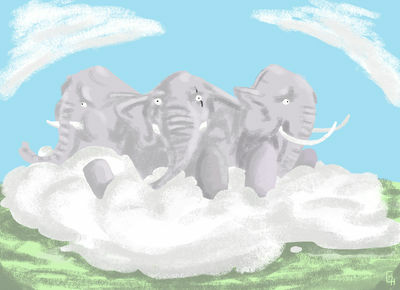 There was nothing else at hand in the prairie, and further away were the elephants, which were not too friendly. The elephants obeyed Dante, a giant elephant who was the king between all the animals. The lion never achieved to conquer, nor scratch nor scare it. 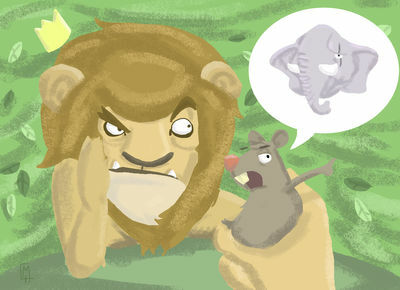 The mouse, surrounded by the lion, began to chitchat. -Weren't you the king? How is it that you are satisfied with such a small and poor prey as me?-said the mouse. -For pleasure -answered the lion and took a step forward. He was a very big animal and his long hair touched the ground. The mouse was shaking from feet to head, but he should think fast in something or would die. -You are not the king?–insisted the mouse. -I will be –roared the lion, gazing at the elephant Dante who was strolling there very calmly. -They say that you can't conquer him-said the mouse. -What you are talking about, fur-ball? Have you seen yourself? You have as much hair as a cat, what kind of mouse are you? -I am the intelligent kind –said the mouse-. Have you heard the saying, "Lion's tail, and Mouse’s head"? Well, I will use my head now. -And I will use your body to satisfy my hunger! Arrrfff! –roared the lion, impatiently. -Just a second! –shouted the mouse, raising his hands. He was a fat mouse and with long whiskers like black needles. The lion really saw him very appetizing. -What happened now? Speak, anyhow I will eat you. -I bet you that I can make the elephant run away –proposed the mouse with a lot of security. -Whattt??? Oh, this is something very good! –laughed the lion, laughing made him seem more voracious. -I bet my head, or better my body, against your tail. I bet your tail, I will make the elephant Dante run like he had seen a ghost –challenged the mouse. -Fine. Do it, I can delay my lunch for a few minutes–the lion accepted mockingly. -Yes, yes, bla, bla… I will observe you from here–grumbled the lion. The mouse, more relieved, was out of danger. When he got close to Dante he only had to make a sound in the scrubland, which sounded like a snake dragging itself. The mouse knew that elephants are scared of the snakes well the sting in the elephant's trunk could be mortal. Then the mouse ran rapidly until Dante heard him, he thought that it was a snake and zas, elephants' stampede! All the flock ran behind Dante, making the ground shake. The lion hiding in the hill couldn't believe what he saw. He was astonished. How did he manage such a feat this little subject, all hair and whiskers? -Take my tail. Go ahead; gnawing it like it was a piece of cheese, until cutting it! –yelled the lion, roaring of rage. -No, no, stay with it! –responded the mouse, returning being cool, although for a second he had thought about disappearing. -Let's go, cut it! 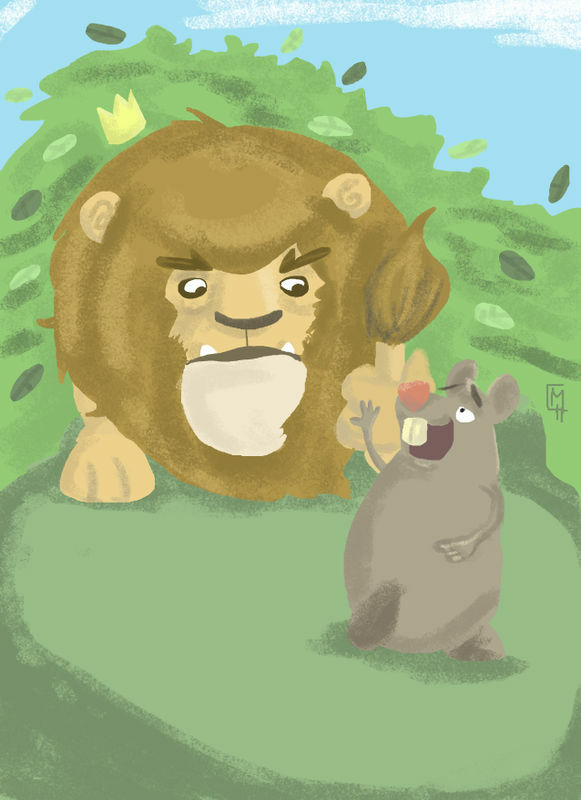 I don't deserve nor a little bite!–lamented the lion. -Mmm, you would look very ugly without the tail, and to me I can't use it for nothing. Stay with it. -I apologize!–said the lion-. Never will I think that you are little and that you can't do things that I would do only because I am more powerful. -Goodbye, lion friend. Remember that you owe me one... one tail. And the mouse distant himself rapidly, just in case if the lion remembered that he was very hungry and would eat him.